Bringing this best-selling textbook right up to date, the new edition uniquely integrates the theories and methods that drive the fields of biology, biotechnology and medicine, comprehensively covering both the techniques students will encounter in lab classes and those that underpin current key advances and discoveries. The contents have been updated to include both traditional and cutting-edge techniques most commonly used in current life science research. Emphasis is placed on understanding the theory behind the techniques, as well as analysis of the resulting data. New chapters cover proteomics, genomics, metabolomics, bioinformatics, as well as data analysis and visualisation. Using accessible language to describe concepts and methods, and with a wealth of new in-text worked examples to challenge students' understanding, this textbook provides an essential guide to the key techniques used in current bioscience research. 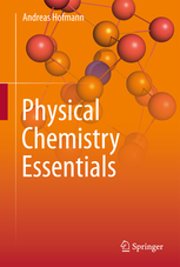 This textbook covers the fundamentals of physical chemistry, explaining the concepts in an accessible way and guiding the readers in a step-by-step manner. The contents are broadly divided into two sections: the classical physico-chemical topics (thermodynamics, kinetics, electrochemistry, transport, and catalysis), and the fabric of matter and its interactions with radiation. Particular care has been taken in the presentation of the algebraic parts of physico-chemical concepts, so that the readers can easily follow the explanations and re-work relevant discussion and derivations with pen and paper. The book is accompanied by a rich mathematical appendix. Each chapter includes a selection of (numerical) exercises and problems, so that students can practice and apply the learned topics. An appendix with solutions allows for controlling the learning success. Carefully prepared illustrative color images make this book a great support for teaching physical chemistry to undergraduate students. This textbook mainly addresses undergraduate students in life sciences, biochemistry or engineering, offering them a comprehensive and comprehensible introduction for their studies of physical chemistry. It will also appeal to undergraduate chemistry students as an accessible introduction for their physical chemistry studies. 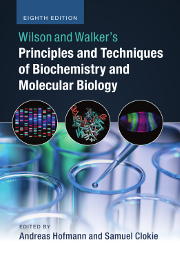 Delivering fundamental insights into the most popular methods of molecular analysis, this text is an invaluable resource for students and researchers. It encompasses an extensive range of spectroscopic and spectrometric techniques used for molecular analysis in the life sciences, especially in the elucidation of the structure and function of biological molecules. Covering the range of up-to-date methodologies from everyday mass spectrometry and centrifugation to the more probing X-ray crystallography and surface-sensitive techniques, the book is intended for undergraduates starting out in the laboratory and more advanced postgraduates pursuing complex research goals. The comprehensive text provides strong emphasis on the background principles of each method, including equations where they are of integral importance to the individual techniques. 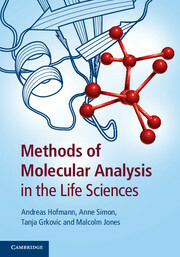 With sections on all the major procedures for analysing biological molecules, this book will serve as a useful guide across a range of fields, from new drug discovery to forensics and environmental studies. 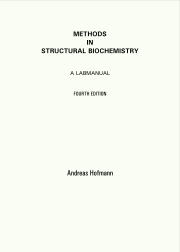 This Lab Manual provides the experimental procedures as well as the fundamental background for methods used in a structural biochemistry laboratory. It is a collection of methods and procedures routinely used in our laboratory and subject to annual additions. This Manual is an integral part of our laboratory and as such constitutes a write-up of standard operating procedures for reference and training purposes, as well as Health & Safety and Good Laboratory Practice.